Robe continues its support of innovative performance … as a major technical sponsor of the fabulous Caravan Stage Society Inc., which presents unique theatre shows aboard its 30 metre tall ship theatre, the ‘Amara Zee’. A diverse selection of international actors, musicians, artists and technicians work aboard the Amara Zee (the ‘Caravan’). Performances are staged on the decks and in the rigging of the ship, delighting audiences on the shore or river bank with their vibrant productions as the vessel tours the coastlines of Europe and North America. Robe SRO has now supported Caravan for two consecutive years. CEO Josef Valchar comments: "Music and performance have been an important part of my life and I think it’s vital to encourage others to enjoy and engage with the experience and positive energies. Caravan is an extremely inventive company that reaches out to so many who would maybe not attend a formal theatre production. We are very proud to be involved." Robe has supplied Caravan with high quality LED fixtures in the form of four of the new ROBIN DLX Spots, six LEDForce 7 PARs, plus two fog machines. "Our lighting designers all recommended that Caravan used Robe lights as they are the best theatrical fixtures on the market," enthuses Caravan founder and producer Adriana Kelder. She adds that they were all particularly delighted to take delivery of the newest Robe DLX Spots, which will be in action on their upcoming season. The Caravan currently works with four professional lighting designers - Lutz Gock from Germany, Robbie Steen and Tom Richmond from the UK, and Laird MacDonald from Toronto, Canada. Having Robe on-board has really made a difference to the look and feel of the shows that can be produced. The DLX Spot has been specially designed for theatrical applications, with its colour outputs in excess of a 1200W discharge unit, yet drawing a fraction of the power of conventional discharge units. The optical system produces a smooth, high quality light output with no shadows and it has a versatile 10 – 45 degree zoom. A host of effects features include static and rotating gobo wheels, variable frost, three faceted prisms and a full range of dimming and strobing options. Kelder thinks that Robe fixtures are ideal for Caravan’s specific style of performance and for outdoor theatre in general. Reasons include their small size, excellent array of colours and of course, the energy saving properties coupled with Robe’s commitment to producing ‘smaller-brighter-lighter’ units. She adds that the intensity and coverage of the fixtures "work best" with the large scrims that Caravan regularly uses in its shows and concludes, "Robe’s staff are all a joy to deal with – they are super-friendly, helpful and very professional." The first Caravan show to use Robe products was 2012’s ‘Uprising’ which toured Sicily and Italy. This year, the lights will be used on ‘Hacked – The Treasure of the Empire’ which tours the USA and Canada, continuing into 2014. 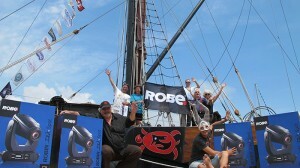 Kelder is looking forward to Caravan Stage enjoying a fruitful long term relationship with Robe as a sponsor.